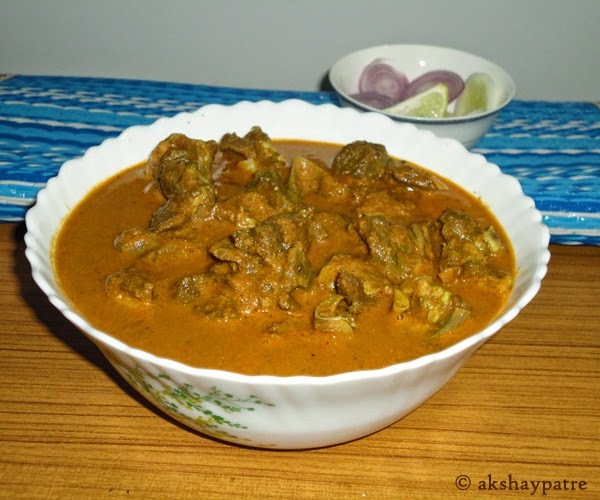 Goan mutton curry recipe - Goan spicy mutton curry is one of the popular authentic, traditional mutton dish of Goa. 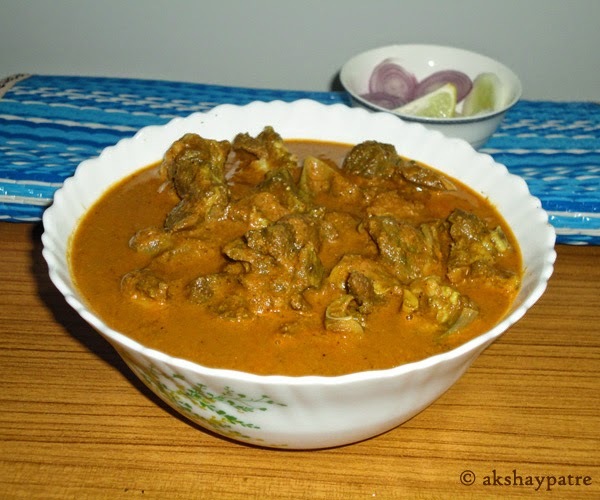 This mutton curry I have prepared is slightly different than the traditional Goan mutton curry. While preparing this curry, I have skipped adding the yogurt for marination and instead marinated the mutton with my favorite green masala paste prepared with cilantro, green chillies, ginger, garlic, cumin seeds, lemon juice and salt. 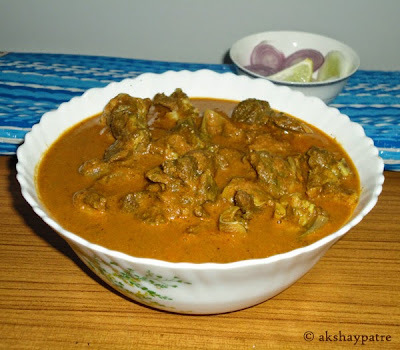 If you are looking for something spicy but different than normal mutton curry marinated with yogurt, this version will be a perfect one to try and taste. It goes very well with hot rice, rice roti, dosa, idly, chapati, and ghee rice. Mix together the ingredients mentioned under "for the green masala paste"except lemon and salt and put them in a mixer jar. Grind it to a smooth paste adding very little water. Transfer this green masala paste to a bowl, squeeze the lime in it, add salt and mix well. Clean and trim the mutton. Cut them into 3/4" sized pieces. Wash them thoroughly under running water. Transfer the mutton to a large vessel. Add 6 tablespoon of green masala paste to the mutton and marinate. Reserve the remaining green masala paste in the fridge. Add fistful of chopped onions to the marinated mutton and mix well. Keep the marinated mutton in the refrigerator for about an hour. In the meantime, place a pan on medium heat and pour in 3 tbsp of oil. Add onions and saute for 5 minutes or till the onions turn light brown in colour. Heat 2 teaspoon of oil in another pan and fry coriander seeds, cloves, cinnamon and black pepper together till they become aromatic. Remove and set aside. Combine the coconut and chilli powder together and dry roast till the coconut become aromatic. Mix the fried onions, roasted coconut and chillii powder mixture, coriander seeds, lavang, dalchini, jeera, black pepper, kashmiri chilli powder together and set aside to cool down to room temperature. Transfer the mixture into a mixer jar and grind to a smooth paste using very little water. Transfer the ground masala paste into a bowl and set aside. In another pan, heat 5 - 6 tablespoon oil on medium heat. Add the cumin seeds, cinnamon and cloves. Allow them to crackle. Add the brown cardamoms and saute for few seconds. Add the marinated mutton and saute for 5 minutes. Transfer the mutton to a deep vessel. Add the ground masala paste, garam masala and salt to taste. Add some water to get the desired consistency. Place the pressure cooker on medium heat and pour in some water. Place the vessel with mutton masala mixture in the cooker and take 4 - 5 whistle and then 5 minutes on low flame. When the presssure releases, remove the vessel and simmer on low flame for 5 minutes. Serve hot with roti, chapati, idli, dosa, hot rice, ghee rice or jeera rice. 1. Mix together the ingredients mentioned under "for the green masala paste"except lemon and salt and put them in a mixer jar. Grind it to a smooth paste adding very little water. Transfer this green masala paste to a bowl, squeeze the lime in it, add salt and mix well. 2. Clean and trim the mutton. Cut them into 3/4" sized pieces. Wash them thoroughly under running water. Transfer the mutton to a large vessel. 3. Add 6 tablespoon of green masala paste to the mutton and marinate. Reserve the remaining green masala paste in the fridge. 4. Add fistful of chopped onions to the marinated mutton and mix well. Keep the marinated mutton in the refrigerator for about an hour. 5. In the meantime, place a pan on medium heat and pour in 3 tbsp of oil. Add onions and saute for 5 minutes or till the onions turn light brown in colour. 6. Heat 2 teaspoon of oil in another pan and fry coriander seeds, cloves, cinnamon and black pepper together till they become aromatic. Remove and set aside. 7. Combine the coconut and chilli powder together and dry roast till the coconut become aromatic. 8. Mix the fried onions, roasted coconut and chillii powder mixture, coriander seeds, lavang, dalchini, jeera, black pepper, kashmiri chilli powder together and set aside to cool down to room temperature. 9. Transfer the mixture into a mixer jar and grind to a smooth paste using very little water. Transfer the ground masala paste into a bowl and set aside. 10. In another pan, heat 5 - 6 tablespoon oil on medium heat. Add the cumin seeds, cinnamon and cloves. Allow them to crackle. 11. Add the brown cardamoms and saute for few seconds. Add the marinated mutton and saute for 5 minutes. 12. Transfer the mutton to a deep vessel. Add the ground masala paste, garam masala and salt to taste. Add some water to get the desired consistency. 13. Place the pressure cooker on medium heat and pour in some water. 14. Place the vessel with mutton masala mixture in the cooker and take 4 - 5 whistle and then 5 minutes on low flame. 15. When the presssure releases, remove the vessel and simmer on low flame for 5 minutes. 16. 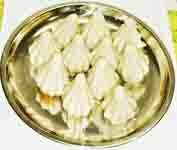 Serve hot with roti, chapati, idli, dosa, hot rice, ghee rice or jeera rice. Happy cook, Thanks for visiting my space.